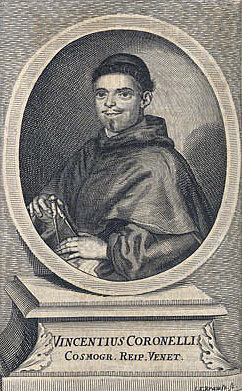 Vincenzo Coronelli, a Franciscan priest lived most of his life in Venice and was born 1650. He was well known because of his mathematician and geographical knowledge and became the greatest Italian cartographer of the late 17th century. He published a large two volume Atlante Veneto and became Cosmographer to the Venetian Republic. He also produced large celestial and terrestrial globes. He died in 1718. Antique map of Northern Australia, Borneo. Printed in Venice in the year 1696. Vincenzo Maria Coronelli: Terre Artiche. Antique map of the North Pole. Printed in Venice in the year 1691. Coloured map of Africa. Printed in Venice in the year 1701. Circular map of the eastern hemisphere by Coronelli. With decorative borders including signs of the zodiac. From Atlante Veneto . Antique map of the world. Printed in Venice by V. M. Coronelli circa 1690. Coloured map of Australia, Japan, Southeast Asia. Printed in Venice in the year 1697. Copper engraved map of the Alsace from V. M. Coronelli. Covering the Black Forest, Breisgau with the area between Rheinfelden via Basel up to Breisach. Antique map of the Black Forest, Breisgau, Alsace. Printed in Venice in the year 1691.